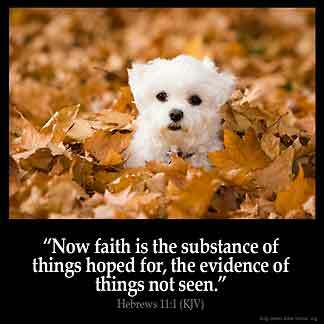 Inspirational Bible Verses now available as Posters or Ebooks. 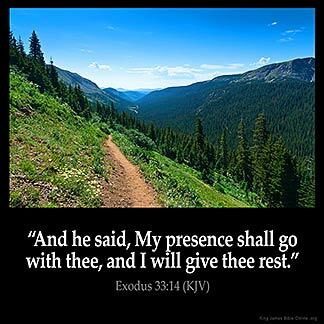 Exodus 33:14 — "And he said, My presence shall go with thee, and I will give thee rest." 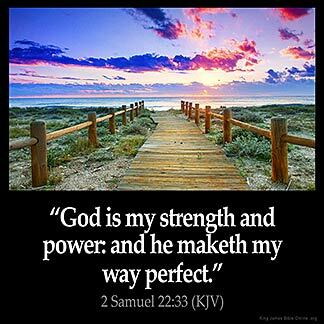 2 Samuel 22:33 — "God is my strength and power: and he maketh my way perfect." 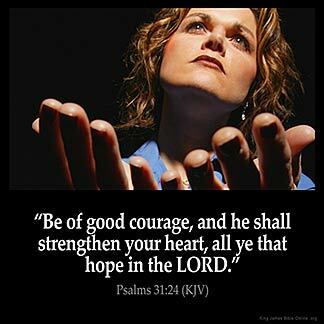 Psalms 31:24 — "Be of good courage, and he shall strengthen your heart, all ye that hope in the LORD." 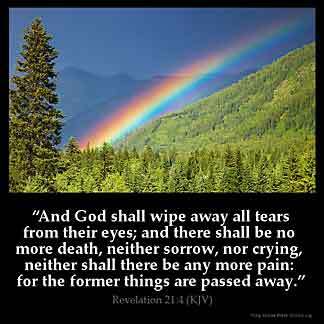 Revelation 21:4 — "And God shall wipe away all tears from their eyes; and there shall be no more death, neither sorrow, nor crying, neither shall there be any more pain: for the former things are passed away." 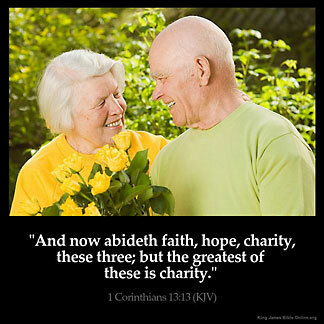 1 Corinthians 13:13 — "And now abideth faith, hope, charity, these three; but the greatest of these is charity." 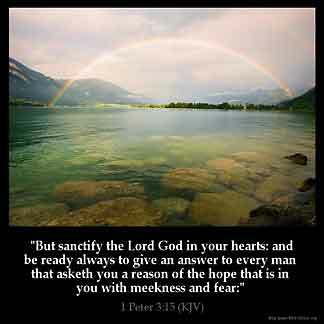 1 Peter 3:15 — "But sanctify the Lord God in your hearts: and be ready always to give an answer to every man that asketh you a reason of the hope that is in you with meekness and fear:"
Hebrews 11:1 — "Now faith is the substance of things hoped for, the evidence of things not seen." 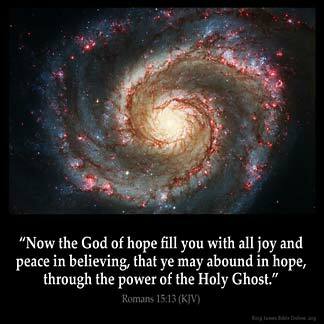 Romans 15:13 — "Now the God of hope fill you with all joy and peace in believing, that ye may abound in hope, through the power of the Holy Ghost." 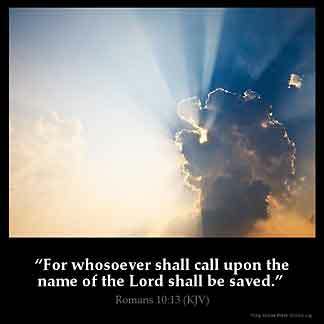 Romans 10:13 — "For whosoever shall call upon the name of the Lord shall be saved." 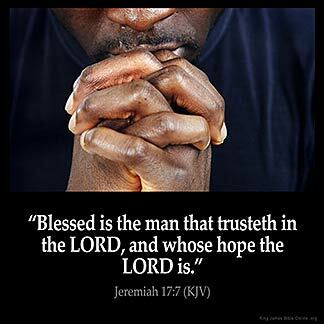 Jeremiah 17:7 — "Blessed is the man that trusteth in the LORD, and whose hope the LORD is." 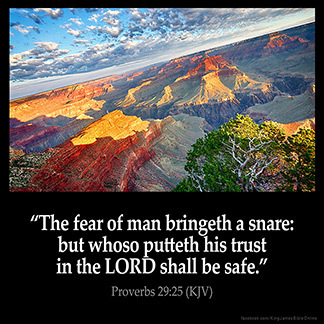 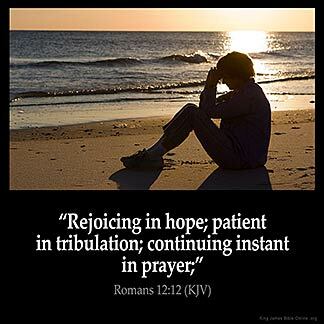 Romans 12:12 — "Rejoicing in hope; patient in tribulation; continuing instant in prayer;"
Proverbs 29:25 — "The fear of man bringeth a snare: but whoso putteth his trust in the LORD shall be safe." 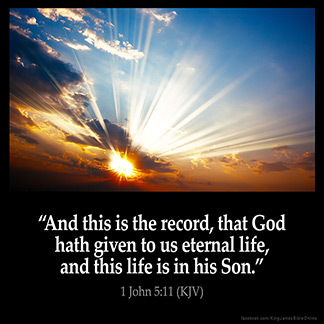 1 John 5:11 — "And this is the record, that God hath given to us eternal life, and this life is in his Son." 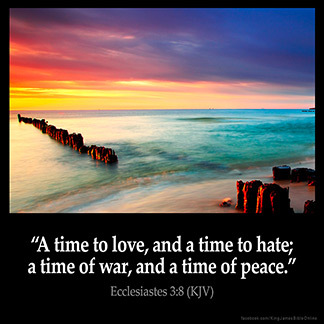 Ecclesiastes 3:8 — "A time to love, and a time to hate; a time of war, and a time of peace."